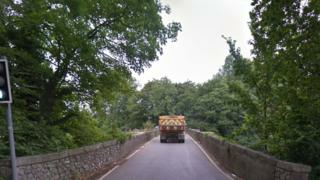 More than 2,500 bridges in England are not fit to support the heaviest lorries, a study has found. Devon County Council has the highest number of substandard bridges with 249, followed by Somerset (210) and Essex (160). Councils currently have plans to repair just 416 of them nationally, blaming a shortage of funds and a lack of skills. Many of the structures have weight restrictions in place, while others have to be closely monitored. Some have also been put in a managed decline, researchers found. RAC Foundation director, Steve Gooding, said: "In the face of growing traffic volumes and ageing infrastructure the danger is that without an adequate long-term funding settlement we will see more rather than fewer bridges with weight restrictions, with the backlog bill getting bigger all the time." In September, a Grade 1 listed bridge in Marlow, Buckinghamshire, was closed for months after it was driven over by a lorry more than 10 times heavier than its weight limit. Last July a driver was fined after he ignored eight warning signs before driving a lorry more than six times the weight limit over Swarkestone Bridge, Derbyshire, which is an ancient monument. Almost half (47%) of bridges managed by Slough Borough Council are inadequate, more than anywhere else in England, followed by Bristol (37%). The cost of clearing the backlog of work on all bridges is estimated to be £3.9bn. The survey was carried out in partnership with the Association of Directors of Environment, Economy, Planning and Transport. See the figures for all councils here.